For such a high-end guitar, the M80M’s body design is actually a little… well, plain. But simple is sometimes better, and Ibanez do the simple things very well, choosing a lovely piece of solid ash for the double cutaway body. This is finished in a ‘weathered black’, which is nothing short of awesome. As is the craftsmanship, fretwork, and set-up – you’re ready to go as soon as you open the box. It features an extra-long 29.4” scale length, with a bolt-on five-piece maple/walnut neck, strengthened with KTS TITANIUM rods for huge stability. Considering the size, it’s a very comfortable neck to play, with a slim, flat profile and smooth satin feel. Just like any Ibanez, it’s fast too. Finally, the All Access neck joint and deep cutaways allow good access to the 24 jumbo frets of the rosewood fretboard. Great for shredding. Hang on… I’m paying all this cash and there’s only one pickup? That’s right, although Ibanez stick with the theme of doing the simple things very well indeed. The single pickup, fitted at the bridge, is a Lundgren Model M8P humbucker, which is deliberately lower output than some of the superhot pickups we see in this market. However, the sound, as you will read, benefits. Elsewhere, the tuning stability is fantastic. There’s a set of good-quality Ibanez tuners (4+4 configuration), with an FX Edge III-8 bridge and a locking nut. And yes – the M80M comes with a good-quality hardshell case, proving a very nice addition. The M8P humbuckers have the honor of being specifically designed for the M80M, so you may have expected this guitar to sound pretty awesome. And that it does. The pickups are slightly lower output, but in this case less is more. They still offer a powerful sound while remaining articulate, balanced and tight across the fretboard, no matter how much gain is added – one of the pluses of the long scale length. Obviously, it’s very well-suited to heavy rock and extreme metal, but it would actually be just at home playing country, blues and jazz. Fantastic. What can we say? Consider us impressed. Yes, the price is high, but the M80M seems to fully justify every penny. It’s a guitar that doesn’t bend over backwards to offer loads of wow-factor additions – instead it does the simple things incredibly well. For experienced players and professional musicians, the M80M is highly recommended. 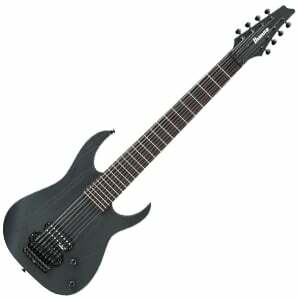 For more info about the Ibanez M80M Meshuggah Signature, click here. For more 8 String Electric Guitar you might like, click here.